Regardless of whether you’re striving to wring the last bit of productivity from your iPhone—or are simply organizationally challenged—inTouch Contacts promises to bring order to your expanding Contacts database. While developer Objects Etc offers a sophisticated vision of how to achieve that goal in this $5 app, a number of limitations and cumbersome features mark inTouch Contacts as merely an interesting first effort. A Look Ahead: inTouch Contacts’ Home Page offers a useful view of upcoming events for easy reference. However, since events aren’t selectable, getting details requires several additional steps. inTouch Contacts links to your existing Contacts database, providing a view of—and the option to edit—existing individuals and companies. Inconveniently, you can’t create new records, so adding a person or company requires the native Contacts application. inTouch Contacts provides better support for Contacts’ Group records. You can import existing records into inTouch, create new Groups, and then export them back to the native database. inTouch Views provide dynamic lists of contacts, including useful breakdowns by organization and city. Retrieving a list of everyone you know who works at a particular company, or tracking down friends while visiting a city are nearly effortless with inTouch Contacts. The application also offers search capabilities. inTouch Contacts introduces two new objects—Activities and Events. Activities provides arbitrary groupings of people and organizations, such as people who like to golf, poker buddies, or the garden club. They function almost identically to the iPhone’s built-in Groups—with the exception that Activities can’t be synchronized with the Contacts application. Events provides the ability—shamefully missing from the phone’s built-in calendar application—to invite individuals or groups (and, confusingly, activities) to meetings or get-togethers. Unfortunately, Events doesn’t support reminders, and the processes for adding or removing people is unwieldy. An event doesn’t show up on your iPhone calendar until someone is added, at which point an iCal invitation is dispatched. For solo events, you must invite yourself and accept the resulting invite to get the event on your calendar. Several other features show potential, but are implemented in such a way as to disappoint or frustrate. A Home Page, for example, reveals a list of upcoming events. But you can’t directly select any of the displayed events for review. Instead, you must first go to the Events display, then select a specific event—a time-consuming effort that defeats the purpose of the single display. inTouch Contacts supports e-mailing selected contacts, groups, or activities, but a proprietary e-mail client introduces several major shortcomings. Text entry is limited to a screen providing three (scrolling) lines of text. There is no spell check, and all e-mail uses Objects Etc’s email servers which add an advertisement for the application at the bottom of each mail. Finally, application data isn’t backed up in a normal iPhone synchronization. If you want to protect your information, you’re forced to rely on a built-in FTP client to connect to your Mac or PC. The process is beyond the abilities or knowledge of most non-technical users and introduces unacceptable security issues. 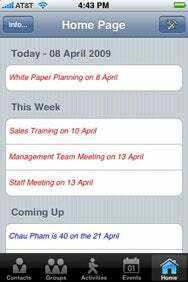 inTouch Contacts is compatible with any iPhone or iPod touch running the iPhone 2.2.1 software update.